Whenever I go away for a weekend it always takes me at least a full week to catch up on my Google Reader. Here are a bunch of links I’ve been saving to share. I love the T Magazine blogs. They constantly show me interesting new things. For example, Alexandra Marshall’s post yesterday showed me my newest fantasy over which I shall obsess for the next two weeks: I want to move to Paris and open a cupcake bakery. I am not a big Paris person. I know lots of people who are in varying degrees of love with Paris, but I have always been a London girl myself. My dad is British and I’ve lived in London and I just think it’s the bee’s knees and I have British citizenship and therefore I have an appropriate amount of stubborn disdain for anything French. I’ve been to Paris several times and I can understand the appeal. After all, fashion, art, food, and wine are four of my favorite things and Paris knows how to do all of those things extremely well. I’ve just never really clicked with La Ville-Lumière the way that I have with London and New York. However, over the past year or so I’ve decided that I need to give Paris another chance. I don’t know if I’ve watched Ratatouille too many times or if Julia Child has brainwashed me or if my desire to read Proust in the original French is actually driving me insane, but I have an overwhelming conviction that I need to spend more time in Paris. And now, on top of all that, I find out that cupcake shops are a rising trend in Paris! If I were braver and more impulsive and had tons of money stashed away I’d be jetting across the Atlantic right now, furiously studying cupcake recipes, Parisian real estate trends, and French verb conjugations. Unfortunately that’s not the case, so I shall have to read about it in the Times instead. I know this has been all over the blogosphere today, but Marc Jacobs is going to open a bookstore in the West Village called Book Marc. The shop’s going to be at 400 Bleecker, the Biography Book Shop’s old home and right across the street from Magnolia Bakery. Some people are all in a tizzy because it’s supposedly going to taint the genuine, old-school literary nature of the neighborhood and expand Marc’s West Village shopping empire. I’m actually pretty excited to see what sort of bookstore Marc will throw together. And let’s be serious, there absolutely needs to be some kind of bookstore across the street from Magnolia Bakery. 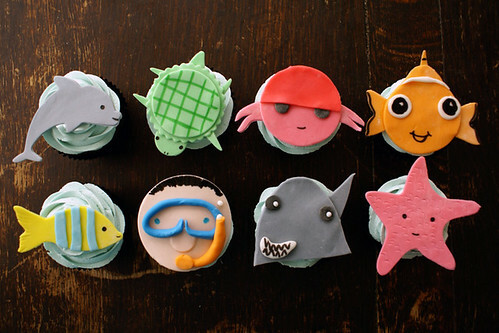 Books and cupcakes are two of my favorite things in the world! 1. Cashew Strawberry Crunch from Martha Stewart. This looks so delicious and refreshing! Much lighter than the original PB & J. It’s cashew butter on Ryvita Fruit Crunch, topped with fresh strawberries and drizzle of honey. Yum. 2. There are several recipes for peanut butter and jelly cupcakes around. The delicious cupcake pictured above was baked at Tee & Cakes in Boulder, CO and was featured in a post on the lovely cupcake blog Cupcakes Take The Cake. 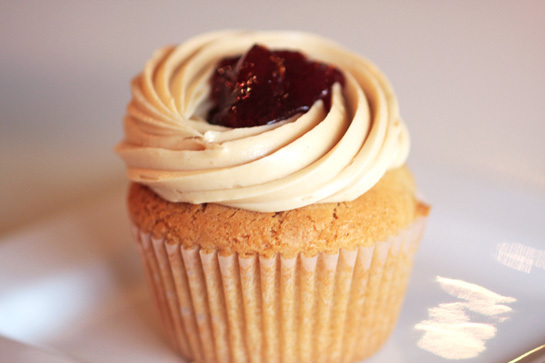 If you want to try making your own PB&J cupcakes, check out the recipes at Serious Eats, Food Network, and CD Kitchen. 3. 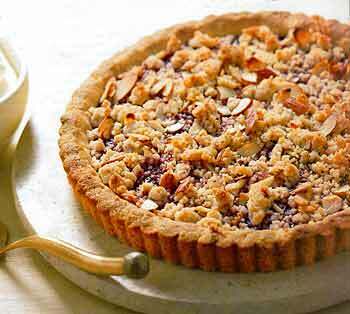 This Raspberry Jam and Almond Crumble Tart takes the idea of PB&J to a whole new level. It originally appeared in the December 2000 issue of Gourmet and can now be found on Epicurious. It looks delicious and super sophisticated, but for me the appeal is definitely the reference (intentional or not) to the classic sandwich. Do you have a favorite take on peanut butter and jelly? Leave it in the comments!